Ensure your coffee is ready when you need it, with a thermal carafe that keeps coffee hot and fresh for hours. Conveniently portable. Maintains an optimum flavor profile without the need for warming plates. Sleek, black-and-steel design is elegant, complementing almost any kitchen setting. 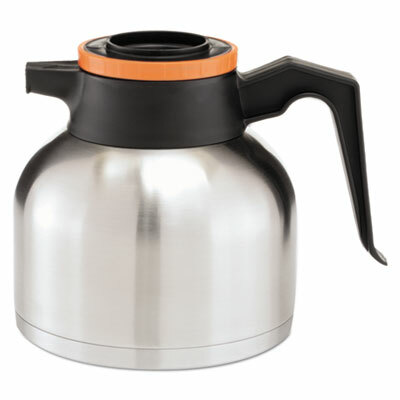 Material(s): Stainless Steel/Polypropolene; Color(s): Stainless Steel/Black/Orange; Capacity (Volume): 1.9 Liters (64 oz); Warmer: No. Ensure your coffee is ready when you need it, with a thermal carafe that keeps coffee hot and fresh for hours. Conveniently portable. Maintains an optimum flavor profile without the need for warming plates. Sleek, black-and-steel design is elegant, complementing almost any kitchen setting. 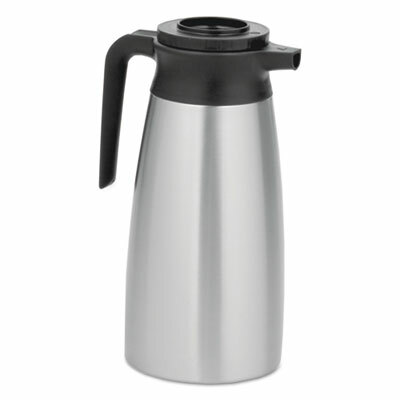 Material(s): Stainless Steel/Polypropolene; Color(s): Stainless Steel/Black; Capacity (Volume): 1.9 Liters (64 oz); Warmer: No. Ensure your coffee is ready when you need it, with a thermal pitcher that keeps coffee hot and fresh for hours. Conveniently portable. 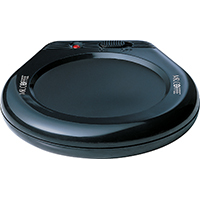 Maintains an optimum flavor profile without the need for warming plates. Sleek, black-and-steel design is elegant, complementing almost any kitchen setting. 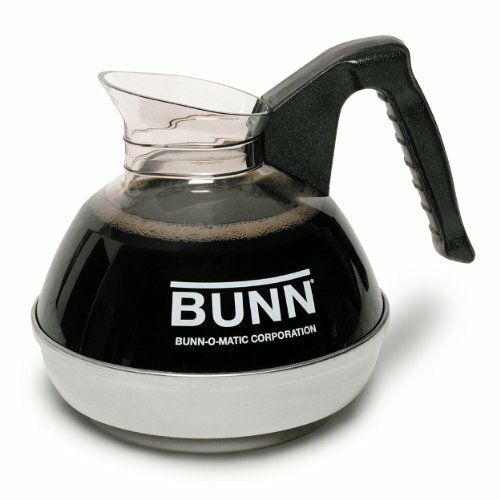 Material(s): Stainless Steel/Polypropolene; Color(s): Stainless Steel/Black; Capacity (Volume): 1.9 Liters (64 oz); Warmer: No. Nothing stands between you and your coffee, with a convenient, quick-brewing machine that brews coffee in three minutes. Includes hot water reservoir to make hot chocolate, tea, soup, cereal, and more. Thermostat-controlled brewing temperature. 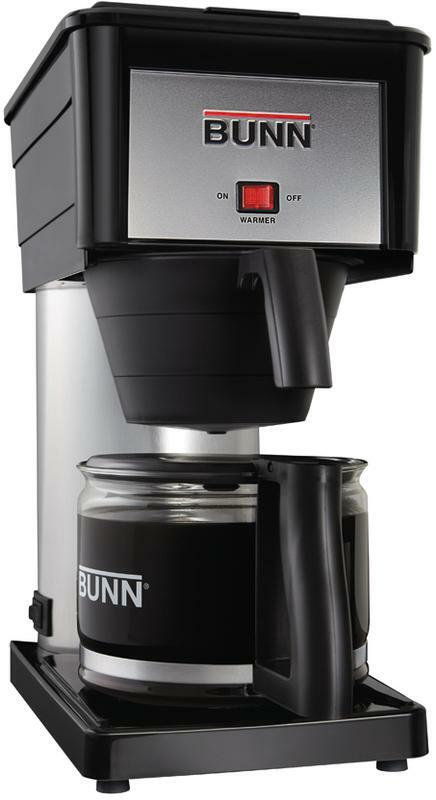 Includes 10-cup thermal carafe, coffee funnel and 25 filters. Number of Cups: 10; Number of Burners: 1; Warmer: No; Capacity (Volume): 50 oz. Features locking safety lid, carry handles and dripless safety spigot. Includes double wall insulation, cup tray and volume sight glass. Grounded cord with three-pronged plug. Built in filter baskets. No need for disposable filters. Number of Cups: 100; Material(s): Stainless Steel/Plastic; Color(s): Stainless Steel; Height: 23". Ideal for busy households, this 12-cup programmable coffeemaker can be set to brew a full pot of fresh, hot coffee up to 24 hours in advance. It's ready when you want it and the 12-cup capacity means there's always plenty to go around. With the Pause 'N Serve feature you can pour a cup while the coffeemaker is still brewing by stopping the cycle momentarily. Removable filter basket makes clean-up easy. Dual water window allows you to easily monitor filling capacity. Two-hour auto shut-off maintains safety, even when you're not home. It is adaptable for water filtration (filter sold separately) so you can help reduce up to 97% of chlorine for better tasting coffee. Number of Cups: 12; Warmer: Yes; Width: 9 5/8"; Depth: 12 1/2". 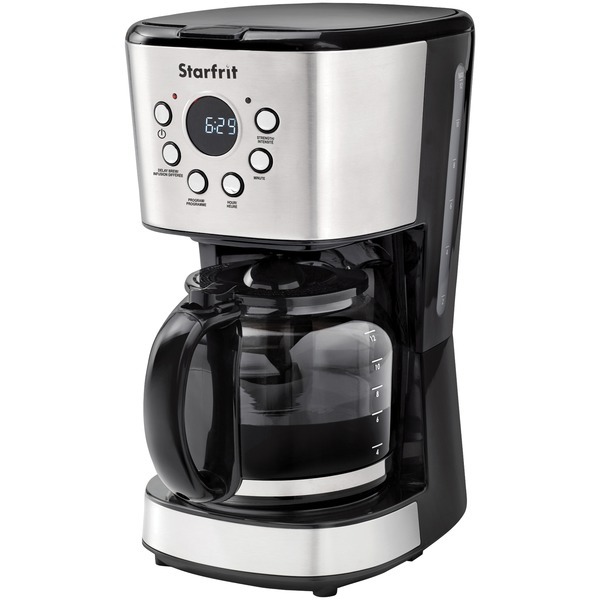 Ideal for busy households, this 12-cup programmable coffeemaker can be set to brew a full pot of fresh, hot coffee up to 24 hours in advance. It's ready when you want it and the 12-cup capacity means there's always plenty to go around. With the Pause 'N Serve feature you can pour a cup while the coffeemaker is still brewing by stopping the cycle momentarily. Removable filter basket makes clean-up easy. Dual water window allows you to easily monitor filling capacity. Two-hour auto shut-off maintains safety, even when you're not home. It is adaptable for water filtration (filter sold separately) so you can help reduce up to 97% of chlorine for better tasting coffee. Number of Cups: 12; Warmer: Yes; Width: 9 3/4"; Depth: 12 1/2". Get fresh brewed coffee wherever the job takes you with the 18-Volt LXT Lithium-Ion Cordless Coffee Maker (DCM500Z, Tool Only). No paper filters are needed, just your favorite ground coffee, water and a Makita 18-Volt Lithium-Ion battery. It will brew up to three 5 oz. 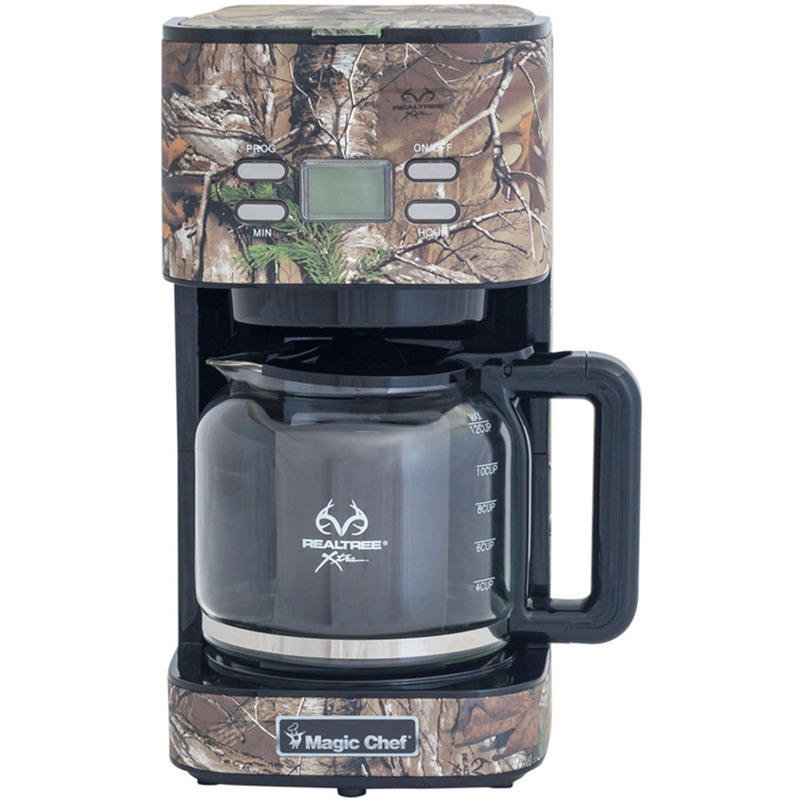 cups of coffee on a single charge of an 18-Volt LXT 5.0Ah battery (sold separately). It is also compatible with Makita 18-Volt 4.0Ah, 3.0Ah, and 2.0Ah batteries. For added convenience, the battery adapter can be removed for use with AC power. Get fresh brewed coffee wherever the job takes you with the 18-Volt LXT Lithium-Ion Cordless Coffee Maker. No paper filters are needed, just your favorite ground coffee, water and a Makita 18-Volt Lithium-Ion battery. It will brew up to three 5 oz. cups of coffee on a single charge of an 18-Volt LXT 5.0Ah battery (sold separately). It is also compatible with Makita 18-Volt 4.0Ah, 3.0Ah, and 2.0Ah batteries. For added convenience, the battery adapter can be removed for use with AC power. Includes: DCM500Z & BL1820B 18V Battery 2.0AH. Keeps coffee hot and fresh for hours. 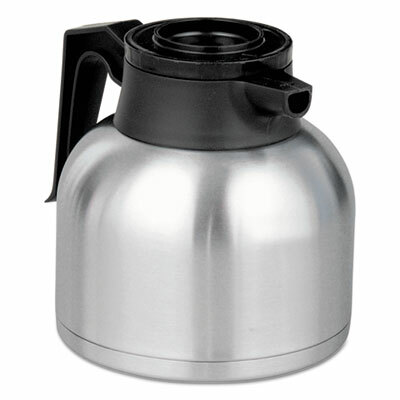 Material(s): Stainless Steel; Color(s): Stainless Steel; Capacity (Volume): 2.2 Liters; Quantity: 1 each. Conveniently brew directly from brewer. Beverage dispenser features an all-stainless steel construction and lever style pump for easy serving. 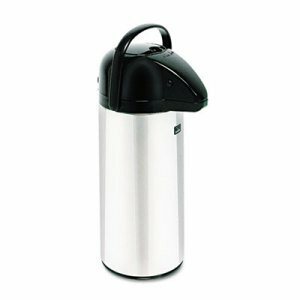 Seamless stainless steel vacuum liner is durable and ensures beverages remain cold or hot for hours. 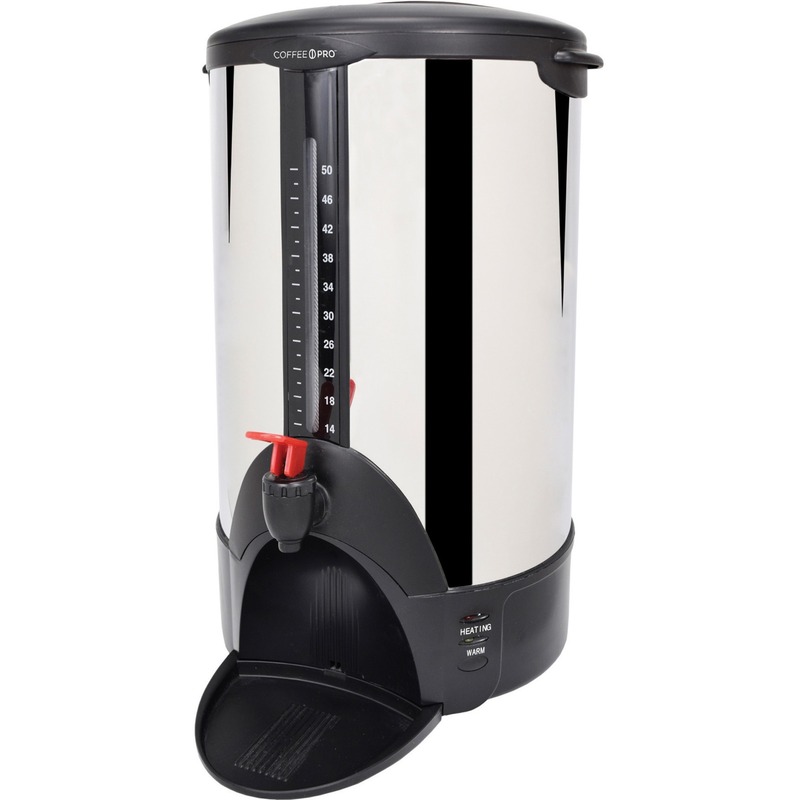 Lid is designed to swing open fully for brewing directly into airpot funnel for ease of filling and maximum heat retention. 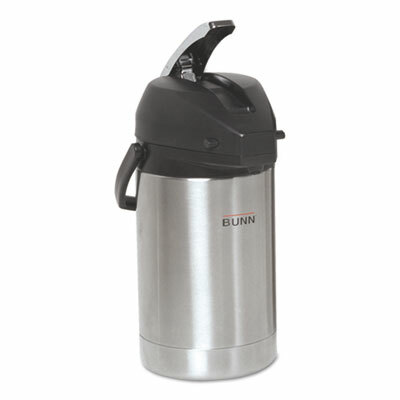 Material(s): Stainless Steel/Plastic; Color(s): Stainless Steel/Black; Capacity (Volume): 2.5 Liters (84 oz); Warmer: No. Conveniently brew directly from brewer. Beverage dispenser features an all-stainless steel construction and lever style pump for easy serving. 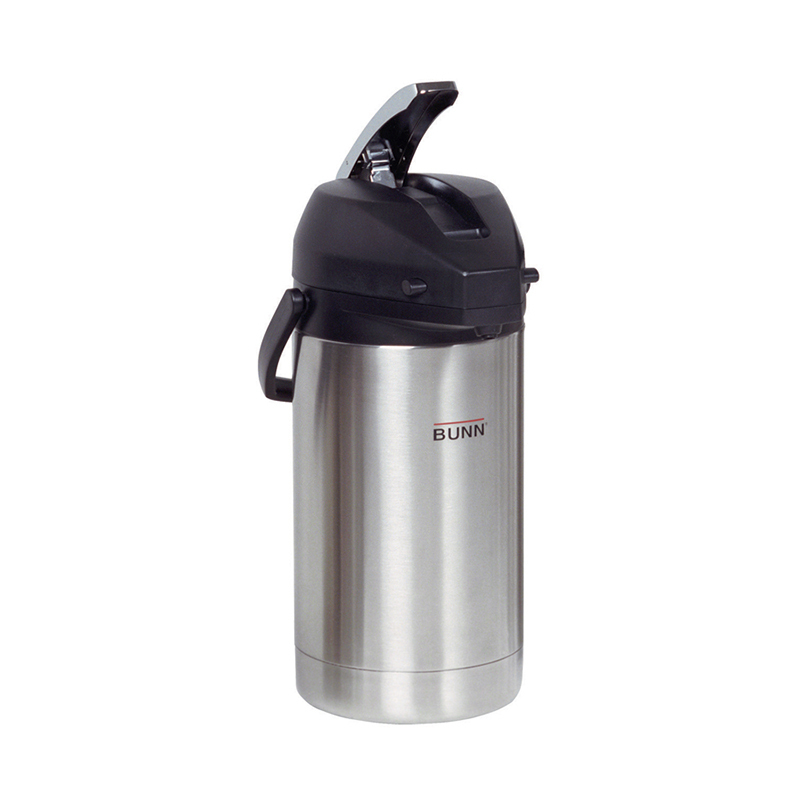 Seamless stainless steel vacuum liner is durable and ensures beverages remain cold or hot for hours. Lid is designed to swing open fully for brewing directly into airpot funnel for ease of filling and maximum heat retention. 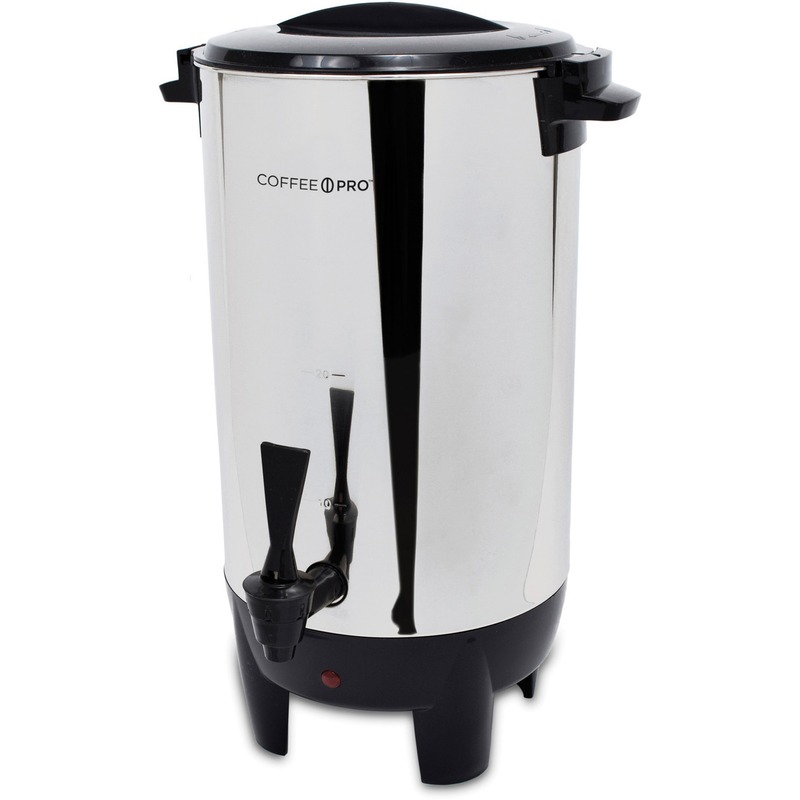 Material(s): Stainless Steel; Color(s): Stainless Steel; Capacity (Volume): 3 L; Warmer: No. Features locking safety lid, carry handles and dripless safety spigot. With high dome design, volume sight glass and lighted power switch. Standard two prong plug. Includes water dispenser. Built-in coffee filter. No need for disposable filters. 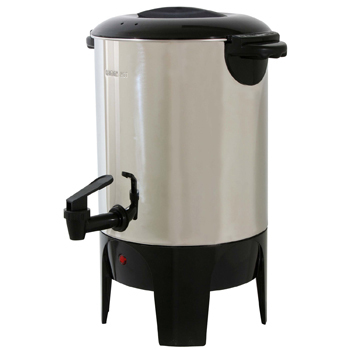 Number of Cups: 30; Material(s): Stainless Steel; Color(s): Stainless Steel; Height: 15". Features locking safety lid, carry handles and dripless safety spigot. Includes double wall insulation, cup tray, volume sight glass and standard two prong plug. Built-in coffee filter. No need for disposable filters. Number of Cups: 50; Material(s): Stainless Steel/Plastic; Color(s): Stainless Steel; Height: 18". Stainless steel base, impact-resistant plastic top, drip-proof spout. Insulated grip handle. 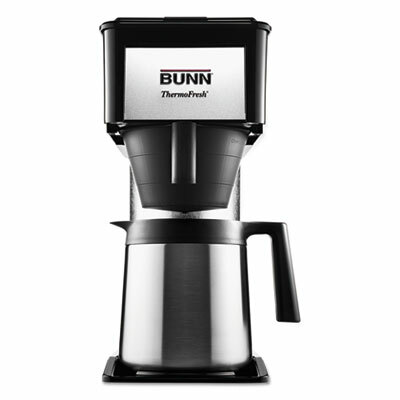 Capacity (Volume): 64 oz; Number of Cups: 12; Color(s): Stainless Steel; Material(s): Stainless Steel. Brews 75 ounces (2.2 liters). Features quick brew cycles and fresh water pour-over. Grounded cord with three prongs. Includes air pot. Number of Cups: 7.75; Capacity (Volume): 75 oz; Width: 8 3/4"; Depth: 14 3/4". Meet your office Barista. 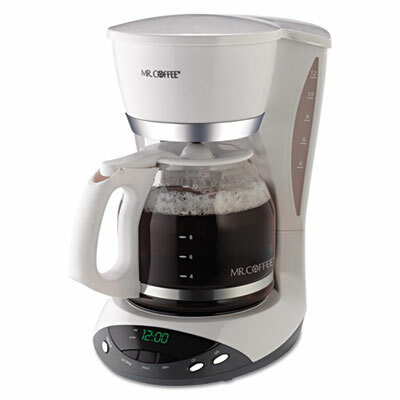 Easy-to-use countertop coffee machine delivers authentic caf�-style beverages at an affordable price. Its compact design and simple technology make it suitable for any location. 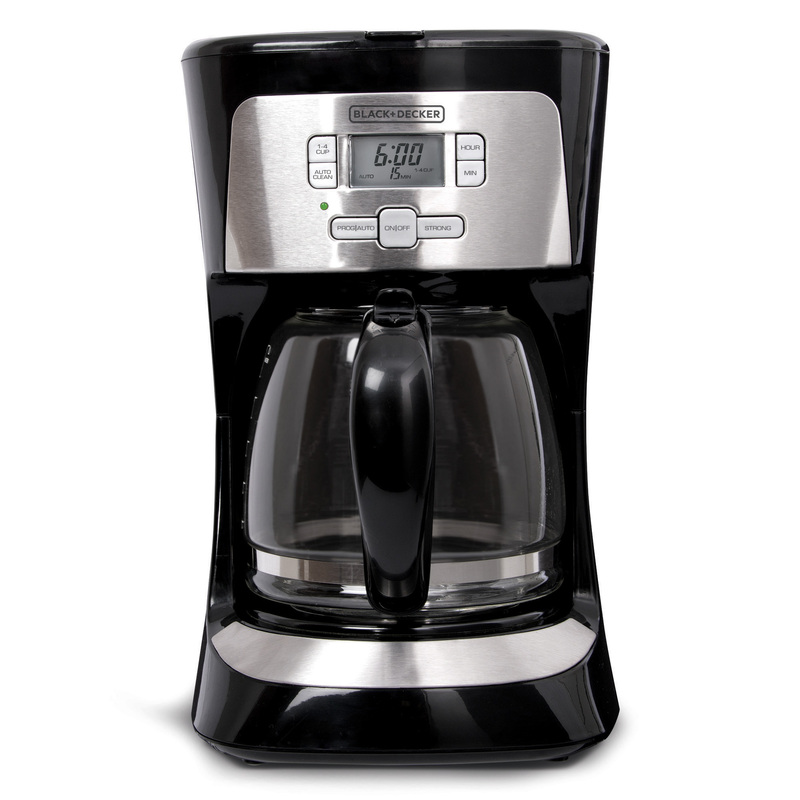 Brewing one beverage at a time ensures the freshness of every cup. Ground-coffee packs (aka: morsels) always brew a rich, aromatic cup that's full of flavor. Unit features presets for five cafe beverages: Espresso, Americano (Espresso added to water), Lungo (water added to Espresso), Cappuccino (Espresso with milk and milk foam) and Latte (Espresso with milk). Try them all! Number of Cups: 1; Capacity (Volume): 2 L; Width: 10 3/10"; Depth: 14". 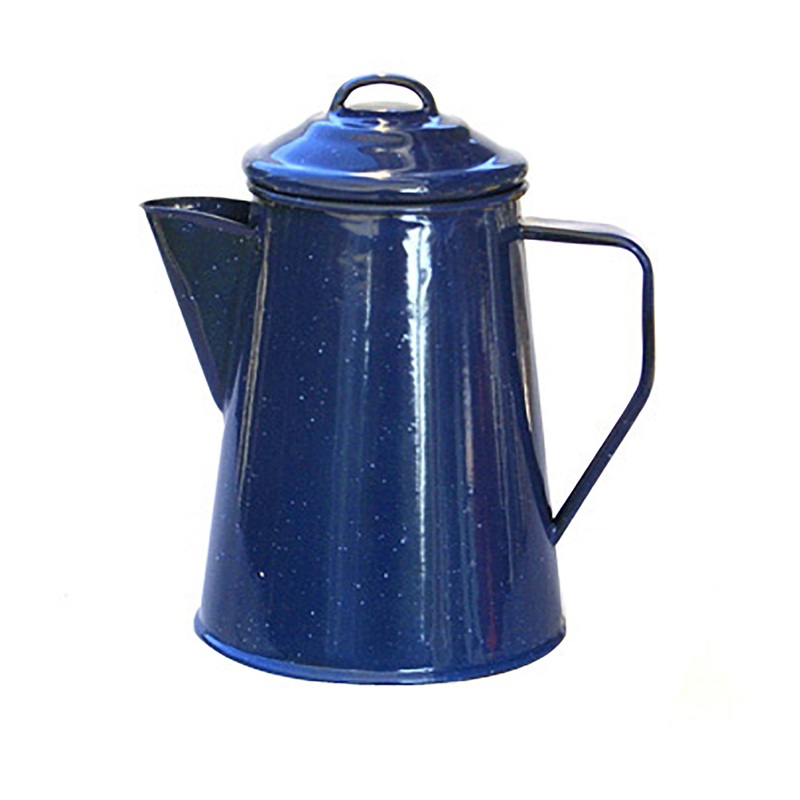 With the 8 Cup Enamel Coffee Percolator, making coffee in the morning at your campsite jut got easier. The enamel coated steel is rust resistant, ensuring that this set will be long lasting. The percolator will make up to 8 cups of coffee at a time and is quick heating, meaning less time devoted to getting ready in the morning. The enamel coating also provides for a quick and easy clean up. 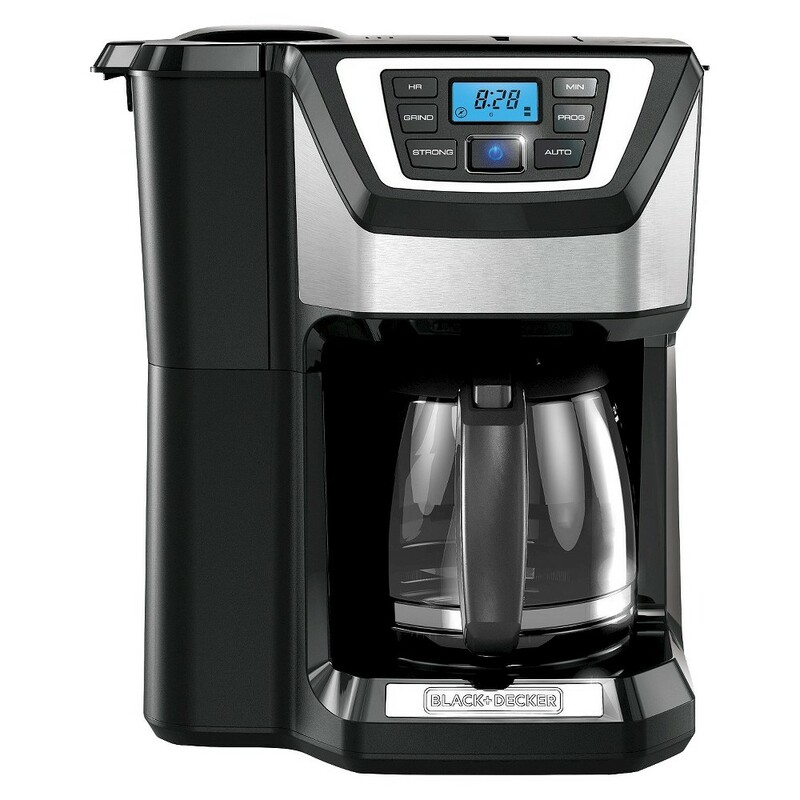 The AmeriHome 30 Cup Coffee Maker can brew 30 cups of coffee in 30 minutes making it ideal for hosting holiday parties at home, catering, family reunions or the office. Brew hot coffee or heat water for hot tea and hot chocolate. 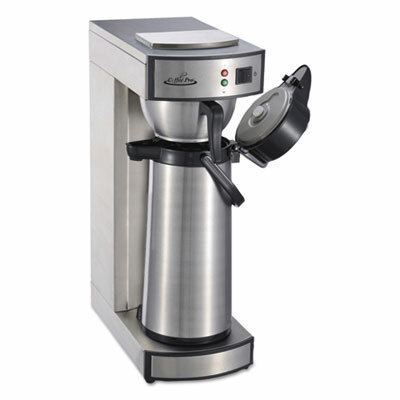 The stainless steel urn keeps the coffee warm at 185 degrees F after brewing has completed. Great for home or office use. 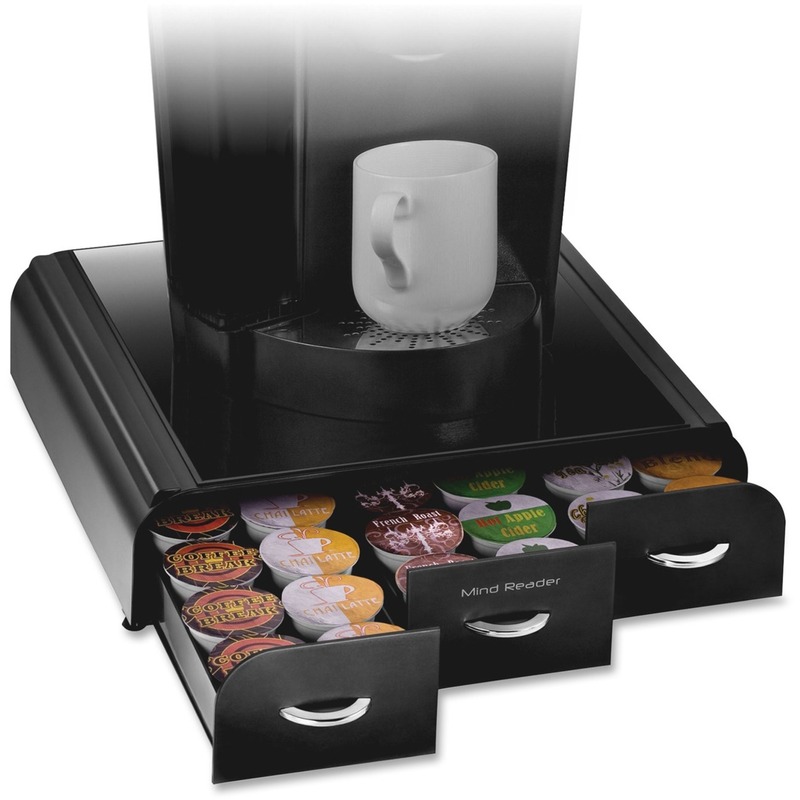 Three-drawer cabinet keeps all of your favorite single-serve coffee cups organized: 12 single-serve cups per drawer, holding a total of 36. Durable frame provides a safe and convenient, space-saving place to position and operate your machine. Contemporary-modern chrome handles. Width: 13 23/50"; Depth: 12 87/100"; Height: 2 18/25"; Compartments: 3. 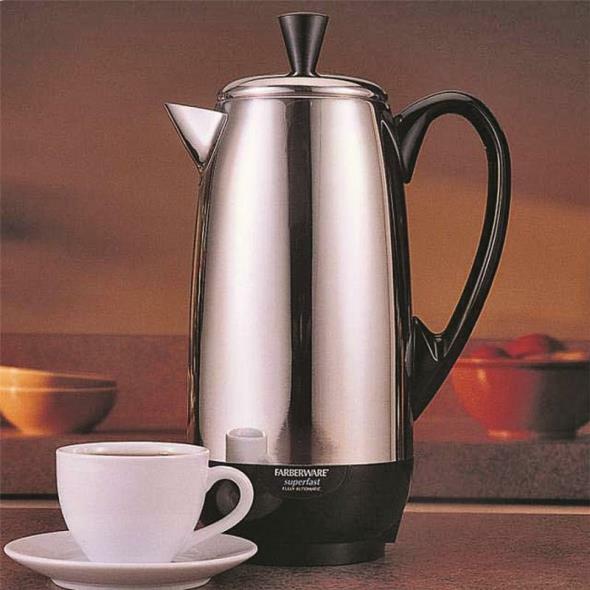 The iconic Farberware percolator is a thing of beauty, and this modern version actually makes good coffee, too! The slender stainless carafe houses a 1000-watt heater, which brews a cup of coffee a minute, and makes that nostalgic burbling sound. As soon as the coffee is brewed, the heater automatically switches to Keep Warm, so your coffee doesn't scorch. The cool-touch handle and lid pull let you serve and clean up neatly and painlessly. When you're not making coffee, the removable cord stores inside, so you can put the unit in the cabinet, instead of sacrificing your counter space. Enjoy the wonderful aesthetics of a percolator without sacrificing the rich flavor of your coffee! This item cannot ship to an APO/FPO address. Please accept our apologies. 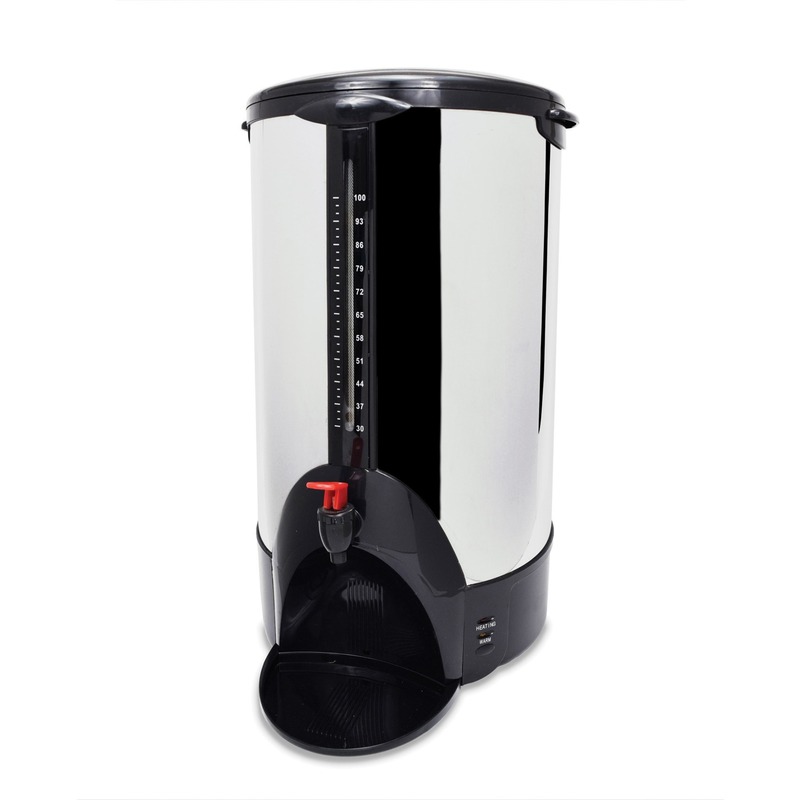 Suitable for most commercial coffee brewers with a larger brew basket design. Number of Cups: 12; Material(s): Paper; Shape: Basket. 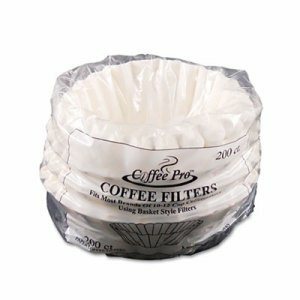 For use in most coffeemaker brands that use basket style filters. Number of Cups: 10; 12; Material(s): Paper; Shape: Basket. 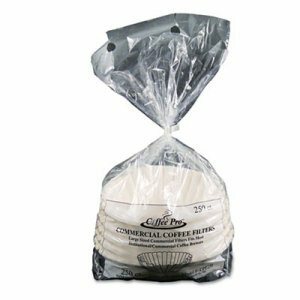 High quality thicker paper creates a sturdy basket style coffee filter. 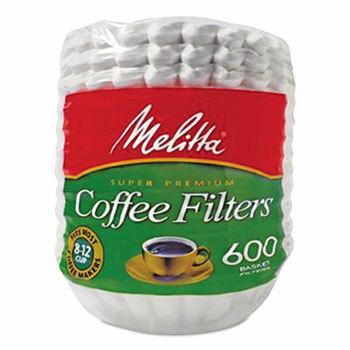 Filters ensure optimal coffee brewing. Perfect for offices and restaurants. Number of Cups: 8 to 12; Material(s): Paper; For Use With: Basket Style Electric Coffeemakers; Shape: Basket. Black & Decker Black finish Mill & Brew Programmable 12-cup Coffee Maker with integrated whole bean Grinder; Streamlined grind-to-brew process captures essential oils and aromas released at grinding for fuller richer flavor; Single Easy-Clean Brew Basket for both grinding and brewing; Angled display panel with large backlight display screen and large soft touch buttons for easy programming; Brew Strength Selector lets you choose from Regular Strong or Bold; With Auto Programming you set your fresh coffee to be ready when you are; Plastic Stainless Steel and Glass finish. This item cannot be shipped to APO/FPO addresses. Please accept our apologies. 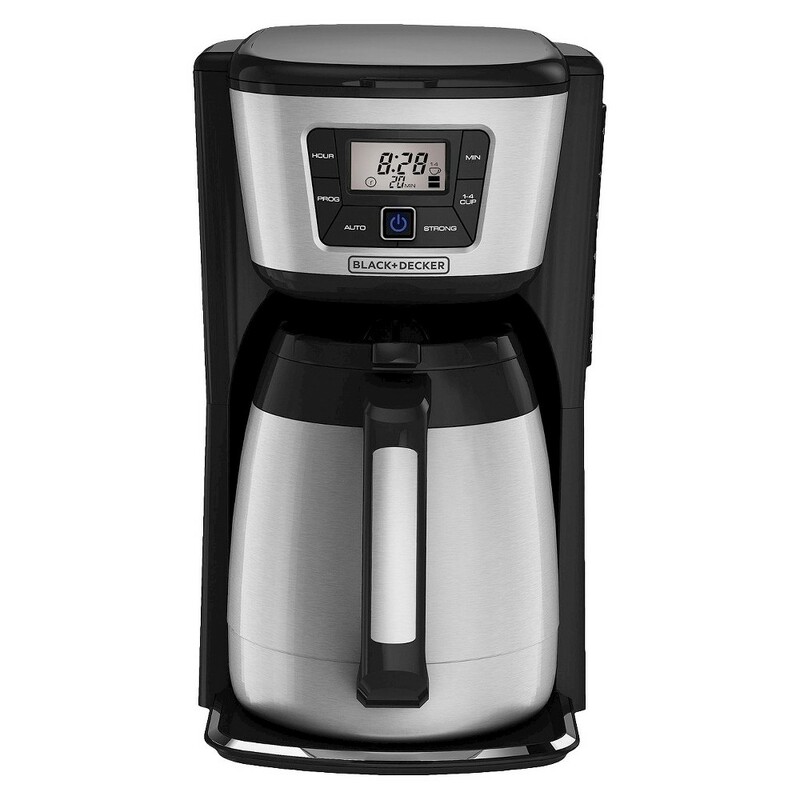 Black & Decker 12-Cup Programmable Coffeemaker with Black finish. Brew Strength Selector for regular or strong settings; 1 to 4 Cup Brew Option ensures the full flavor of a whole carafe at smaller brew sizes; Time Since Brewed shows how long ago coffee was made ensuring freshness; Auto Clean System helps to ensure optimal performance & extends the coffeemaker life; Sneak-A-Cup Feature halts drip temporarily to grab a cup mid-cycle; Optimal Brewing Temperature creates fuller flavor extraction from grids for richer taste; QuickTouch Programming for fast and easy programming; Nonstick 'Keep Hot' Carafe Plate keeps coffee hot resists staining and wipes clean easily; Glass Duralife Carafe with a sturdy handle & reinforced glass provide maximum durability; Cord Storage keeps cord neat and out of the way. This item cannot be shipped to APO/FPO addresses. Please accept our apologies. 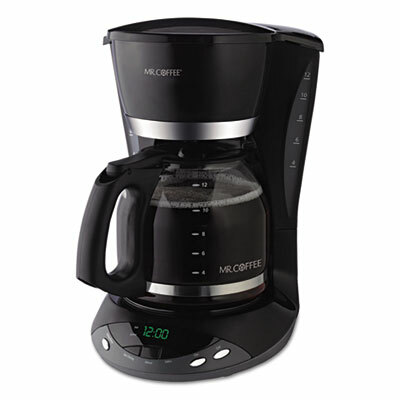 Black & Decker Large Capacity 12 Cup Thermal Programmable Coffee Maker. Extra Large Capacity Thermal Carafe is 20% larger than most thermal carafes in the market holds a full 12-cups; Double-walled vacuum sealed stainless steel carafe retains hot temperatures for hours preserving fresh taste; EvenStream Showerhead Technology for better tasting coffee Faster to optimal brew temperature and better water distribution over coffee grounds for superior flavor extraction; Perfect Pour Carafe seals tightly to retain temperature and wide mouth opening for easy cleaning; Quick Touch Programming makes it easy to have coffee ready when desired; Plastic & Stainless Steel finish. This item cannot be shipped to APO/FPO addresses. Please accept our apologies.